Anjli says she figured if she was going to pay for a gym membership she should try to get the most out of it, so she decided to start by trying some classes. First up — Zumba. “The first 10-minutes were fun, but after that I started to feel weak and out of breath. It felt intimidating,” Anjli said. However, after speaking with Hadji, Rock Crock Sports Club’s ambassador, he encouraged her to try it again, because, as he explained, starting off is tough for everyone. So she did. “Now I’m addicted and I love it,” Anjli exclaims! It didn’t stop at Zumba. 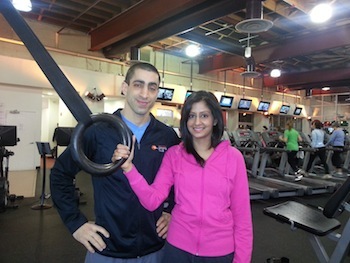 Anjli says she has found a number of ways to get fit and have fun at Rock Creek Sports Club. This includes participating in Hector’s Running Club and several small group training sessions — Craig’s Metabolic Training, Julie’s Inner Strength, and Rob’s Circuit Breaker. Coupled with a change in diet recommend by her doctor —more protein and veggies, more water, no soda and no junk food — Anjli says she has definitely gotten results. “Before I joined the gym, I used to get tired easily and even had trouble walking up stairs without getting out of breath. Since joining RCSC, I have gained healthy weight, am more toned, and have more energy and strength. I feel I am much more productive during the day and can take on a lot more both at work and at home.” she explains. Another recent major milestone for Anjli was running the Cherry Blossom 10-Miler at a 10 minute pace this past spring. Go Anjli!